Moscow is the worldwide champion for railway stations. There are a total of 9 railway stations in the capital and trains leave for more than 12397 different destinations in Russia. The only regions where there are no railways are Chukotka, Kamchatka, the Magadan Region, Tuva and Altai. Even David Bowie got inspired to travel on the Trans- Siberian railway. As for visiting Moscow’s railway stations – this act itself is a journey back into history. Moscow’s railway history starts with the Leningradsky railway station (1849). It was constructed by the famous architect Konstantin Thon whose works include Cathedral of Christ the Savior and the Grand Kremlin Palace, which are all situated in Moscow. At first this railway station was called Nikolaevskaya, in honor of the emperor Nikolai I. He was the one who decided to build a railway connecting Moscow and Saint- Petersburg (at that time it was also called Nikolaevskaya railway station). By the way, it was built under the guidance of American engineers on public money. The Leningradsky railway station is the only station in Moscow which in no way has to do with the Moscow railway – it complies with the Saint-Petersburg railway, just like more than a century ago. 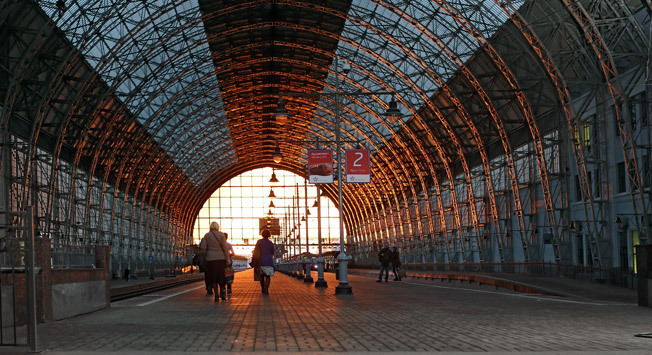 On the Leningradsky railway station you can board a Sapsan to Saint-Petersburg, which will get you there in 3.5 hours. The Arctica train leaves Moscow for Murmansk, a city beyond the Arctic Circle, where fans of trophy fishing and snowboarding often go. Lev Tolstoy will get you to Helsinki, and Estonia – to Tallinn. Karelia goes to Petrozavodsk – from there it’s rather easy to get to the wooden Kizhi Pogost, which is included in the UNESCO list of World Heritage sites and is situated on an island in the middle of the Onega Lake. While you are on the way to your desired destinations, it is recommended to get off the train and see several Old Russian cities, such as Pskov and Velikiy Novgorod. Yaroslavsky railway station has been constructed on the basis of a private initiative, at first it was called Troitsky railway station and in the first years of its existence it connected Moscow with the Trinity Lavra of St. Sergius, the symbol of Orthodox Russia. Fedor Chizhov was the curator of the railway construction project. Besides this he was also the executor of writer Nikolai Gogol’s will and also the editor of his complete works. The Yaroslavsky railway station has become an antipode of the Leningradsky railway station: Slavophil Chizhov wanted to build a railway exclusively on Russian money and only with the help of Russian engineers and workforce. The funds for the construction of this railway were collected by subscription; all the business activity accounts were published 6 times a year in a special newspaper called Aktsioner (Shareholder). From the Yaroslavky railway station trains depart to the eastern and northern parts of the country. This is the place where the Trans-Siberian Railway starts (or ends), and this means that it passes cities such as Khabarovsk and Vladivostok near the Pacific Ocean, Yekaterinburg in the Ural Region, Novosibirsk and Kemerovo in Siberia, not far from the famous ski-resort Sheregesh. Besides this, at this railway station you can board a train to Beijing and Ulan-Bator. The Kazansky railway station is the busiest station in Moscow – trains from here are headed in three completely different directions – to the South, East and South East. It receives 20 percent of the capital’s passenger flow. The first building of the railway station was constructed in the early sixties of the nineteenth century for the Ryazansky and Kazansky railways. As for the new building in the neo-Russian style, it was built in time for 1940 (although the foundation was laid in 1913). From the Kazansky railway station passengers can travel to the capital of summer 2013 Universiade in Kazan, to Grozniy, Chechnya’s capital, to far-off Krasnoyarsk, Barnaul and Ulan-Ude (people often go the Baikal lake from there) and to other Russian and Central Asian cities. The construction of the Rizhsky railway station had started in 1897 and continued for 4 years. Its main goal was to boost the state economy while establishing relations with the Baltic States. The building of the Rizhsky railway station was finally constructed in 1902 in Russian Revival style. From the Rizhsky railway station long distance trains depart to Velikiye Luki and Riga. There is a museum of railway equipment open which is affiliated with the railway station. In this museum you can order an excursion around Moscow on a steam locomotive traction. In the XIX century the Kiev – Voronezh railway Company decided to construct a railway to Moscow from Bryansk (to the west from the capital) and a new railway station, which was to be called Bryansky. The first building of the station looked like an extended construction with two entrances which looked rather provincial. No other railway station in Moscow had received that many snarky caricatures which made fun of the parsimony of a railway company which «decorated Moscow with such a log». To commemorate 100 years since the Battle of Borodino it was decided to build a new train station and to reconstruct the Borodinsky Bridge. Roman Klein, a famous Moscow architect (he designed TsUM and the Pushkin Museum) was trusted to make a project of this bridge. As for the train station – Klein’s student, Ivan Rerberg was set to build it – he created a neo – classical building which was said to be the most beautiful train station in Moscow. The construction of the train station went on for several years and was finished after the revolution, in 1920. From this station trains depart on a regular basis to the west – Stolichniy Express, Kiev and Ukraina will bring you to Kiev, â15 to the Hungarian capital – Budapest, â 59 – to Sophia, â23 and â33 – to the Ukrainian version of Ibiza – to Odessa. The trade development in the Western part of the empire had spurred the construction of railways from Moscow to Smolensk, and then further on to Brest and Warsaw. The coronation of Nicholas II was planned for May 1898 – this is why in order to greet the Tsar’s family on Brest’s railway station it was necessary to quickly complete the construction of the Emperor’s pavilion: a famous architect Lev Kekushev was responsible for it. Just in a few months a wooden chamber was built in the right part of the railway station. From that day on the pavilion had been used numerous times in order to greet notable guests. Unfortunately, it was demolished in 1908 when it was decided to build a more modern railway building. Besides going to Belarusian cities, such as Gomel, Minsk or Brest, trains from this stations are also headed towards cities such as Kaliningrad, a Russian city in the Baltic region (â147), Prague, Vilnius, Warsaw («Polonaise»), Berlin and even Nice. At first the Paveletsky railway station and the adjoined railway spur were intended for the needs of the Ryazano-Uralskaya Railway Company. This was the largest private transportation provider in Russia: in 1900 its railway covered more than 3.500 kilometers. A rather small road segment from Moscow to the Paveletsky station (Ryazansky region) was supposed to connect the capital with the main railway of the Company. This direction was extremely important due to the fact that this was the way bread from the southern part of the Russian Empire was delivered to Moscow. All the main civil servants were involved in the construction of the Paveletsky railway station, even Nicholas II. From Paveletsky station trains mostly depart towards the southern direction – to Kazakhstan (Almaty), and to Russian cities on the Volga river – to Volgograd, Astrakhan, Saratov and the Black Sea’s main port Novorossiysk. In the early 60’s of the nineteenth century there was a real railway boom in Russia: the sad result of the Crimean campaign proved that the transport infrastructure was in need of upgrading. The Kursky railway station building was first built in 1896, but in 1938 it was completely rebuilt. Later, in 1972 the old façade was replaced with a new, modern one. From the Kursky railway station you will be able to leave for Baku (Azerbaijan), Adler, Feodosiya or Sukhumi on the Black sea, Makhachkala (Dagestan’s capital) or Ukrainian Simferopol. This is the only railway station in Moscow with suburban destinations exclusively. Savva Mamontov, a famous Moscow patron of the arts and director of the Moscow – Yaroslavl railway was behind the idea of building such a station. The construction of a new 130 km railway from Moscow to the Savelovo village was completed in 1902. You probably won’t need to go to the Savyolovsky railway station. All the trains are headed towards the northern Moscow region.